Highest EMC protection according to severity fourth. The digital input allows zeroing the strain gauge amplifier or example, a triggerable single value query. 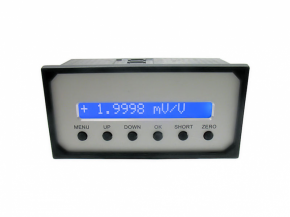 The auto-zero function stores the setting in non-volatile memory in case of power interruption. The strain gauge amplifier has a maximum value function. Data rates from 1Hz to 1000Hz are possible (for 1000Hz is a separate baud rate configuration is required). About a 4-button menu allows you to load up to 6 preset configurations. To use the digital RS232 interface, the software ME GSV Control is available for free. We also offer you calibration of measuring electronics and a system calibration in connection with a sensor. Measuring amplifier in a front panel housing for sensors with straingages. 4-button-control, serial port RS232, RS422, analogue output -10V...+10V / 4...20mA / -5V...+5V, limiting frequency 250Hz, input sensitivity from 2mV/V.